The newest and greatest Windows Server partition magic software. 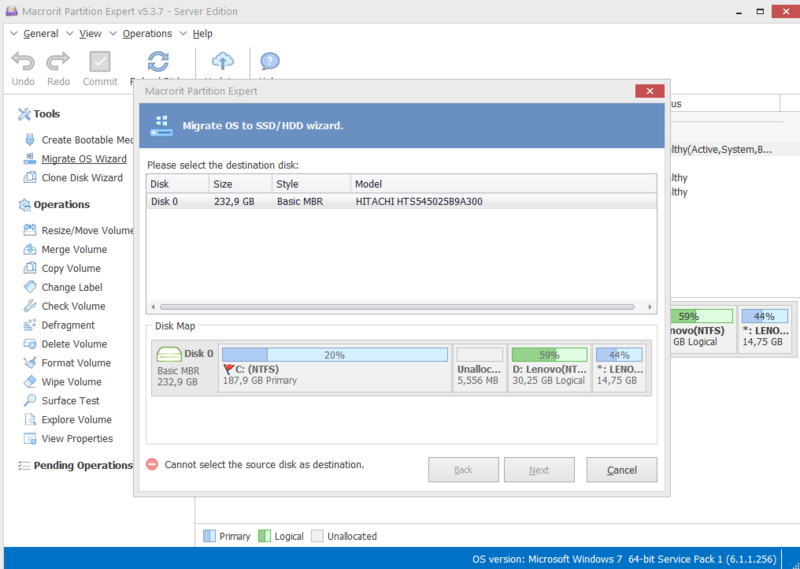 Macrorit Partition Expert Server Edition 5.3.7 (Local & Portable) was available as a giveaway on February 6, 2019! 1. Lietime license with no free upgrades. 2. The activation code must be activated before the expiry date, otherwise invalid. 1. Macrorit PartitionExpertServer Edition V5.x is licensed per computer. 2. Each license allows installation on 1 computer. 3. Transfer of license to another owned computer is not allowed. 4. Free email support is provided for users who purchased lifetime upgrade service. 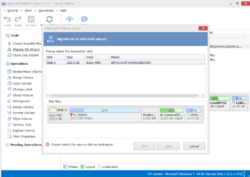 How would you improve Macrorit Partition Expert Server Edition 5.3.7 (Local & Portable)? I have successfully installed both a Portable & PC version (32-bit) on the same computer, using the 1 Activation Key. Made the Portable version 1st, PC version 2nd. Not sure if this will work in a different order? I have successfully installed both a Portable & PC version (32-bit) on the same computer, using the 1 Activation Key. Made the Portable version 1st, PC version 2nd. Not sure if this will work in a different order? frank, worked ok on mine... only times it failed are when I tried to run the 64bit portable folders executable from a mapped network shares drive letter and if I tried to run the 32bit portable locally under WIn10 64bit in both cases the error alert presented did not match the error alert you are reporting... looks like you may have found/exposed an untrapped bug but without more system configuration information like the drive type it was run from and whether that drive was write enabled and so on there is little chance of deducing the cause of the error or offer a workaround. Sorry. Anyone else having problems creating the bootable media ? Each time I ask this giveaway to create the bootable Media it keeps asking for me to install the ADK. It is already installed, but it does not see it, THUS won't allow creation of the bootable media. Does Macrorit perhaps have a linux bootable media available (because MS does not know how to keep things simple) ? Bootable Media creation Anyone else having problems creating the bootable media ? I have W10 Pro 32bit, amd I just installed the MS ADK Each time I ask this giveaway to create the bootable Media it keeps asking for me to install the ADK. It is already installed, but it does not see it, THUS won't allow creation of the bootable media. Does Macrorit perhaps have a linux bootable media available (because MS does not know how to keep things simple) ? Thank you for providing a portable version. Actually, two, as there are both 32 and 64 bit versions in the portable folder. I copied them onto a USB key, launched the 64 bit version and registered it fine. I see where it says we can only install it on one computer. I'm going to be generous and assume that in the case of the portable version, the intention is that we can only install it on one portable drive. Obviously there is no way for the dev to limit the use of the portable version to one computer, but the documentation is confusing as to whether we can register and use both portable versions. Thank you for providing a portable version. Actually, two, as there are both 32 and 64 bit versions in the portable folder. I copied them onto a USB key, launched the 64 bit version and registered it fine. I don't have a machine with 32 bit OS handy. I'm wondering what will happen if I try to run it on a 32 bit machine in the future. Will I be able to register that version, will it already be registered too, will registration fail, or will the attempt break both versions? (readme says: "NB: After you have successfully registered the software, please do not register it again or reinstall it, otherwise the registered version would be turned into a trial.") Will the answer be different whether I run the 32 bit version before or after May 1? (readme also says "Time for activation: Now–May 1st, 2019") I see where it says we can only install it on one computer. I'm going to be generous and assume that in the case of the portable version, the intention is that we can only install it on one portable drive. Obviously there is no way for the dev to limit the use of the portable version to one computer, but the documentation is confusing as to whether we can register and use both portable versions. TK, thank you. I discovered that the mde.lkeys file had been added to both folders when I registered. Thanks also to Macrorit and GOTD. How is it portable if we can.only use it on one computer? Does this unknown forgein company expect us to put it on a server ? Forget that, not gonna happen? Better more established tools available. Furthermore, who are they kidding? Partitions are partitions they are not any different on servers vs desktop nodes. Kalvin, Perhaps you should brush up on your spelling and grammar. Your views may then be more respected! Kalvin, have you tried putting the portable folders that have been activated on one machine onto another machine and run them? No I thought not... I have and it worked fine in fact I activated the 32bit folders instance under 32bit Vista SP2+ and then coppied the key file it created on activation over to the 64bit folder and coppied the folders over to my 64bit Windows 10 laptop via a mapped network drive to a local hard drive folder and executed the 64bit portable executable and it fired up just fine and accepted the previous activation without issue could you be confusing the INSTALLABLE version with the portable folders? and made a bunch of assumptions searching desperatly for some kind of con? Today there are no visible deceptions in todays giveaway... no conflicting license terms or duration and no email harvesting or themida wrapped installer this is one of the cleanest and most honerable giveaways for a long time! And who are you kidding? Windows Server editions support two extra classes of disk storage dynamic volumes and multiple drive arrays via RAID and JBOD technologies. It apears clear that you have a little consumer knowledge but no experience with commercial windows installations or you would know at least some of the significant differnces between server and workstation editions of windows. Kalvin, have you tried putting the portable folders that have been activated on one machine onto another machine and run them? No I thought not... I have and it worked fine in fact I activated the 32bit folders instance under 32bit Vista SP2+ and then coppied the key file it created on activation over to the 64bit folder and coppied the folders over to my 64bit Windows 10 laptop via a mapped network drive to a local hard drive folder and executed the 64bit portable executable and it fired up just fine and accepted the previous activation without issue could you be confusing the INSTALLABLE version with the portable folders? and made a bunch of assumptions searching desperatly for some kind of con? Today there are no visible deceptions in todays giveaway... no conflicting license terms or duration and no email harvesting or themida wrapped installer this is one of the cleanest and most honerable giveaways for a long time! And who are you kidding? Windows Server editions support two extra classes of disk storage dynamic volumes and multiple drive arrays via RAID and JBOD technologies. It apears clear that you have a little consumer knowledge but no experience with commercial windows installations or you would know at least some of the significant differnces between server and workstation editions of windows. TK, are your directed insults supposed to make me apologize or feel safe in installing this program? Why are you so worried about my opinions and bashing me? because I choose not to install a program ? Personal insults don't convince anyone to install anything. I'm not here to gloat about my skills or question yours or to bash anyone. I'm simply pointing out some facts. You are claiming that commercially available software doesn't have the features that this unknown software does. I find that amazingly difficult to believe. My apologies for not choosing to take the bait. For not installing software that I've never heard of, OR any systems admin I've spoken to. I'm sure you'll try and convince others by hurling more insults and attacks, as you've already done. Also nobody uses (jbod) aka Just A Bunch Of Drives raid level as it is garbage. Therefore they wouldn't need to move it's partitions, I'm sure a self proclaimed super genius like you knew that. After all I'm a "consumer level "person according to you. If others want to install everything because it's a free giveaway, that's thier choice. I'll feel free to express my opinion and the facts regarding software any time I please. Please continue to bully and harass as you please, it helps your argument sooooo much. Kalvin, I am not bashing you, just the incorrect information you are propagating which could mislead other users that do not know better into using inappropriate tools not designed to be used with modern windows in a 100% compatible manner. Use of gparted with Windows native file systems is a compromise for those that do not have access for native windows programs which has the potential to do a better and safer job with the windows native file systems... as for whether anyone uses JBOD "arrays" which is NOT a RAID level or even part of the RAID specification at all... have a read of https://en.wikipedia.org/wiki/Non-RAID_drive_architectures I have no idea who uses the arrangment and neither do you BUT I do know gparted will not handle a Windows JBOD cluster of drives in any coherant manner and neither will it deal with a windows server software RAID 5 array. Did you know that it is possible to combine JBOD with RAID1 to provide redundancy and be able to use variable disk dimensions which is certainly not a garbage configuration! I deduced your experience level is that of a consumer with a little knowledge and not that of a IT proffesional that admins any windows servers from your bold, sweeping and incorrect claims about windows servers and desktop editions of windows. I do not believe i declared myself a super genius or even an ordinary genius. In fact I made NO claims about my inteligence at all, just presented some corrections to some of your published misconceptions. I personally DID NOT INSTALL todays giveaways I just placed the portable folders on the machines I wanted to test it on to avoid clutttering my systems with yet another program if I didn't have to. I'd advise others do similar if they already have litteraly thousands of programs installed mostly from here in the past. May I advise you to check out the beam in your eye since you feel so hard done by and bullied simply for being corrected to reduce the likelyhood that others will be maladvised about how to maintain their computers! Believe it or not you have not been bullied by me yet... despite your desire to insult and defame to try and win a point! Kalvin, I am not bashing you, just the incorrect information you are propagating which could mislead other users that do not know better into using inappropriate tools not designed to be used with modern windows in a 100% compatible manner. Use of gparted with Windows native file systems is a compromise for those that do not have access for native windows programs which has the potential to do a better and safer job with the windows native file systems... as for whether anyone uses JBOD "arrays" which is NOT a RAID level or even part of the RAID specification at all... have a read of https://en.wikipedia.org/wiki/Non-RAID_drive_architectures I have no idea who uses the arrangment and neither do you BUT I do know gparted will not handle a Windows JBOD cluster of drives in any coherant manner and neither will it deal with a windows server software RAID 5 array. Did you know that it is possible to combine JBOD with RAID1 to provide redundancy and be able to use variable disk dimensions which is certainly not a garbage configuration! I deduced your experience level is that of a consumer with a little knowledge and not that of a IT proffesional that admins any windows servers from your bold, sweeping and incorrect claims about windows servers and desktop editions of windows. I do not believe i declared myself a super genius or even an ordinary genius. In fact I made NO claims about my inteligence at all, just presented some corrections to some of your published misconceptions. I personally DID NOT INSTALL todays giveaways I just placed the portable folders on the machines I wanted to test it on to avoid clutttering my systems with yet another program if I didn't have to. I'd advise others do similar if they already have litteraly thousands of programs installed mostly from here in the past. May I advise you to check out the beam in your eye since you feel so hard done by and bullied simply for being corrected to reduce the likelyhood that others will be maladvised about how to maintain their computers! Believe it or not you have not been bullied by me yet... despite your desire to insult and defame to try and win a point! You should brush up on your manners, and stop spewing venom at TK just because he dared to correct your statement. How funny when you said "I'm not here to .....bash anyone". Yet, your whole post consists of bashing and negative smart-aleck remarks. And you do not stop at that. In addition, you are throwing MULTIPLE personal insults at TK, and that is just because you got offended by the fact that he pointed out your incorrect claim in your original post. Kalvin, You should brush up on your manners, and stop spewing venom at TK just because he dared to correct your statement. How funny when you said "I'm not here to .....bash anyone". Yet, your whole post consists of bashing and negative smart-aleck remarks. And you do not stop at that. In addition, you are throwing MULTIPLE personal insults at TK, and that is just because you got offended by the fact that he pointed out your incorrect claim in your original post. Grow up, kid. I have been using the free version of Macrorit Partition Expert for a few months now and it is very good. This GAOTD 'Server Edition' Seems to be similar but has the extra Pro facilities - for free. "2. Each license allows installation on 1 computer. So why release portable version? "2. Each license allows installation on 1 computer. 3. Transfer of license to another owned computer is not allowed. So why release portable version? 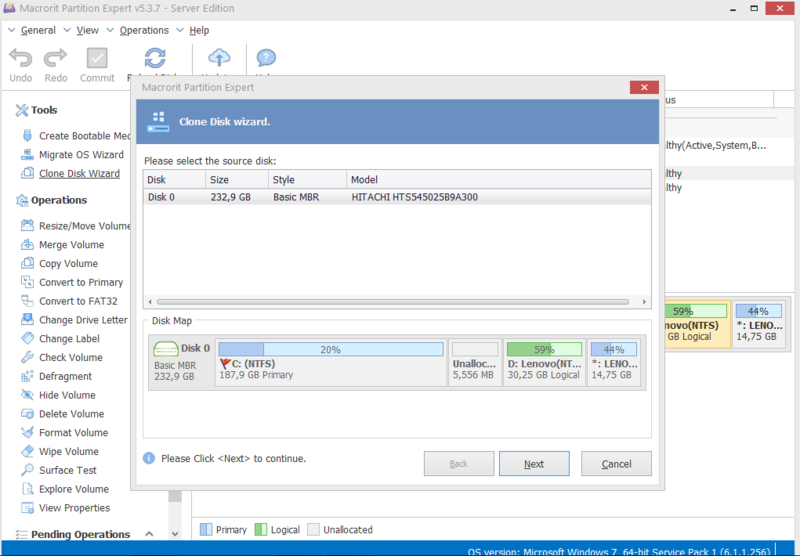 I will stay with Easeus Partition Master (giveaway from BDJ :) Cheers! What is the difference between??? tried to understand from the comment but couldn't really get it. can the portable version manage or handle partition on multiple computers? I'm interested in generally in portable apps but they said here it's licensed to a single computer!! What will this app do that gparted won't? Lewis Murray, it will run under windows XP to 10 and all Server variants and not require you to run a linux liveCD that probably won't support TRIM on SSD's and may not fully support all raid configurations that the host windows will. TK, G-Parted supports TRIM on SSD's. G-Parted also supports hardware RAID, motherboard BIOS RAID, and Linux software RAID. Does Macrorit support all Windows software RAID configurations? I'm not seeing info about that. TK, G-Parted supports TRIM on SSD's. G-Parted also supports hardware RAID, motherboard BIOS RAID, and Linux software RAID. Does Macrorit support all Windows software RAID configurations? I'm not seeing info about that. Exactly , does nothing more and suspiciously claims to be a " server edition or server something"
Lewis Murray, Exactly , does nothing more and suspiciously claims to be a " server edition or server something"
Its always faster and safer to manipulate your partitions with drive offline ie not booted into Windows. The Linux boot CD partition tools exist for that reason. 2 decades ago I used a Windows based popular repartitioning tool, took forever and was very dicey on a 20gb her. Last month I reparitioned 2 different 1TB drives in mere minutes . Installers and users use your own judgement, but I would be cautious, who are these guys? What content do better than the boot to dos mode or Linux based established and low cost or free tools ? It's like android and iOS app stores, there are usually many many apps that claim to do similar things, but only a few are established and have a track record of being honest, safe , stable. TK, Its always faster and safer to manipulate your partitions with drive offline ie not booted into Windows. The Linux boot CD partition tools exist for that reason. 2 decades ago I used a Windows based popular repartitioning tool, took forever and was very dicey on a 20gb her. Last month I reparitioned 2 different 1TB drives in mere minutes . Installers and users use your own judgement, but I would be cautious, who are these guys? What content do better than the boot to dos mode or Linux based established and low cost or free tools ? It's like android and iOS app stores, there are usually many many apps that claim to do similar things, but only a few are established and have a track record of being honest, safe , stable. Kalvin, not strictly true Linux boot CD does NOT understand VSS and the database maintained on NTFS file systems by Windows Server 2003 and Vista and above consiquently after manipulating a VSS protected NTFS partition using gparted the partition needs to be fixed and the volume shadowcopy store cleared and reset by windows chkdsk as linux leaves the NTFS in a dirty state so to speak. Linux cannot be compatible with VSS as the technology is propietary to Microsoft and they have not and will not open up the specs and API to the open source comunity. IF you must offline modify a windows NTFS system the SAFEST way to do it is using a winPE based partition editor of good repute OR a boot time partition editor that loads before main OS bootup NOT using a LInux LiveCD and gparted or qparted or the command line filesystem manipulation tools they use under the hood as they don't understand all the structures used by Microsoft Windows to maintain file system consistency. In addition one should never use VSS on a dual boot system where one operating system does not understand and is not 100% compatible with VSS since when operating under the non-VSS comppliant operating system if ANY writes occour to the intended to be protected by VSS file system will have changes made to sectors that are not mirrored and logged in the VSSStore, which can result in system restore failure or even worse where it completes but the results are inconsitant with the state it is assumed to have been in due to the other operating systems interferance with the filesystem without maintaing a current and consistent VSSStore. Kalvin, not strictly true Linux boot CD does NOT understand VSS and the database maintained on NTFS file systems by Windows Server 2003 and Vista and above consiquently after manipulating a VSS protected NTFS partition using gparted the partition needs to be fixed and the volume shadowcopy store cleared and reset by windows chkdsk as linux leaves the NTFS in a dirty state so to speak. Linux cannot be compatible with VSS as the technology is propietary to Microsoft and they have not and will not open up the specs and API to the open source comunity. IF you must offline modify a windows NTFS system the SAFEST way to do it is using a winPE based partition editor of good repute OR a boot time partition editor that loads before main OS bootup NOT using a LInux LiveCD and gparted or qparted or the command line filesystem manipulation tools they use under the hood as they don't understand all the structures used by Microsoft Windows to maintain file system consistency. In addition one should never use VSS on a dual boot system where one operating system does not understand and is not 100% compatible with VSS since when operating under the non-VSS comppliant operating system if ANY writes occour to the intended to be protected by VSS file system will have changes made to sectors that are not mirrored and logged in the VSSStore, which can result in system restore failure or even worse where it completes but the results are inconsitant with the state it is assumed to have been in due to the other operating systems interferance with the filesystem without maintaing a current and consistent VSSStore. Kalvin, It understands NTFS and is potentially far more compatible with it and all the drivers and filesystems supported by MIcrosoft Windows that are not so supported under linux or completly unsupported under linux. The term server edition means that it will run under windows server operating systems and not just desktop editions of windows there is NOTHING suspicious about the editon name and is not a claim that is in anyway unsupported by the facts. Which is a significantly more expensive license due to it being targeted at enterprise use and should also include support for certain partition technology that is Windows Server specific like software RAID 5 and JBOD and dynamic volumes which are traditionally only supported by the Server editions of windows. I work with it all the time using known tools that all the other people use . Are you confusing yourself and thinking efat??? TK, utter nonsense, far more compatible with ntfs I work with it all the time using known tools that all the other people use . There is no incompatibility of the existing established tools with NTFS Are you confusing yourself and thinking efat??? TK, clearly you've not uses established tools. They don't work under Windows. They don't work on partitions that are being used. And drive systems like fat32, efat, NTFS, all changed and manipulated . Working on a live filesystem is foolhardy at best. Like I said before you do what you want . Since you know more than anyone else who's pointed these things put , same goes for your alter ego. I'm not sure why you guys are promoting this product or what's in it for you to coerce us into installing it. Those that do, do. Those with real world experience already have the established tools and they are either free or low cost. Simply put I don't see the benefit of this product or the point. I've installed some great software from this site and promote it to many many people. Today's software, offers no benefit. Not even to those who don't have a partition management software or drive mgmt software. Likely it will cause damage, rather than "handle ntfs better"
TK, clearly you've not uses established tools. They don't work under Windows. They don't work on partitions that are being used. The drive is safer and can be reparitioned or reorganised **faster **safer And drive systems like fat32, efat, NTFS, all changed and manipulated . Working on a live filesystem is foolhardy at best. Like I said before you do what you want . Since you know more than anyone else who's pointed these things put , same goes for your alter ego. I'm not sure why you guys are promoting this product or what's in it for you to coerce us into installing it. Those that do, do. Those with real world experience already have the established tools and they are either free or low cost. Simply put I don't see the benefit of this product or the point. I've installed some great software from this site and promote it to many many people. Today's software, offers no benefit. Not even to those who don't have a partition management software or drive mgmt software. Likely it will cause damage, rather than "handle ntfs better"
Chris, thanks, yes hardware raid either motherboard or PCIe raid card is transparent to the operating system with suitable drivers in both linux and windows I was specifically writing about windows server software RAID5 which will not be supported under linux. Does gparted TRIM a partions previous SSD allocation if a partition on an SSD is deleted or shrunk? Or does it rely upon the underlying OS kernel TRIM support and the command line fs manipulation utils integration with the OS? Last time I reverese engneered gparted was when I wanted to use it to partiion a larger hard drive for my DVB-T DVR and I needed it to create an EXT2 filesystem with 32kbyte cluster size and gparted and qparted couldn't do it and was stuck using the linux default 4kbyte clusters which caused buffer overflows in the DVR firmware because the cluster count is 8 times greater for any given file system size. I think but may remember incorrectly I ended up using an old copy of the Windows program Powerquest Partition Magic 8.0 from a BartPE liveCD it was several years ago long before SSD drives entered mainstream markets. Chris, thanks, yes hardware raid either motherboard or PCIe raid card is transparent to the operating system with suitable drivers in both linux and windows I was specifically writing about windows server software RAID5 which will not be supported under linux. Does gparted TRIM a partions previous SSD allocation if a partition on an SSD is deleted or shrunk? Or does it rely upon the underlying OS kernel TRIM support and the command line fs manipulation utils integration with the OS? Last time I reverese engneered gparted was when I wanted to use it to partiion a larger hard drive for my DVB-T DVR and I needed it to create an EXT2 filesystem with 32kbyte cluster size and gparted and qparted couldn't do it and was stuck using the linux default 4kbyte clusters which caused buffer overflows in the DVR firmware because the cluster count is 8 times greater for any given file system size. I think but may remember incorrectly I ended up using an old copy of the Windows program Powerquest Partition Magic 8.0 from a BartPE liveCD it was several years ago long before SSD drives entered mainstream markets. Kalvin, er no there is no such thing as eFAT are you confusing yourself and trying to refer to exFAT? Self Education can be as good and sometimes even better than formal education but it can also be a big mistake. How is this better than G-Parted? 1) Is this from a Chinese company? 2) Has anyone here actually used it with good (or bad) results? 3) The folder includes a portable version. Has anyone actually used THAT with good (or bad) results? 4) The readme says that the installation info and code is good for some weeks. Is that true, or good only for today? 5) Some of the comments here show a lack of understanding of what partitions are and how they work. Do NOT use ANY partition-adjustment app unless (a) you have an understanding of what is happening and how disks are differently formatted for different OSes -- and Win 7 and Win 10 are BIOS vs UEFI are all different -- and you have first made a COMPLETE backup of YOUR ENTIRE HARD DISK so you can get back to where you were when you screw it all up. 1) Is this from a Chinese company? 2) Has anyone here actually used it with good (or bad) results? 3) The folder includes a portable version. Has anyone actually used THAT with good (or bad) results? 4) The readme says that the installation info and code is good for some weeks. Is that true, or good only for today? 5) Some of the comments here show a lack of understanding of what partitions are and how they work. Do NOT use ANY partition-adjustment app unless (a) you have an understanding of what is happening and how disks are differently formatted for different OSes -- and Win 7 and Win 10 are BIOS vs UEFI are all different -- and you have first made a COMPLETE backup of YOUR ENTIRE HARD DISK so you can get back to where you were when you screw it all up. Do I need to keep all the other partitions, beside C: Partition, and Recovery Partition? I would like to use this program to make some changes if advisable. A new Windows 10 1809 install will by default create a boot partition, a small 16MB partition, a system or Windows partition, & a Recovery partition. The recovery partition is used for resetting or restoring Windows, can be deleted if you use image backups & don't want to ever use the reset or recovery options, and you may wind up with an extra recovery partition after upgrading win10 versions. The boot partition, the one that's FAT32, is currently 100MB after a new win10 install, but in the past could be 300MB or so. It's necessary for devices with the BIOS set to UEFI mode, since that mode cannot, will not find Windows boot files anywhere besides on a FAT32 partition. The reserved partition size could also vary historically, depending on which version of win10 was originally installed. It can store GPT-related info, and stored the Windows files necessary for BitLocker etc. You can get rid of it, but at 128MB, it's not worth bothering with. consuella, A new Windows 10 1809 install will by default create a boot partition, a small 16MB partition, a system or Windows partition, & a Recovery partition. The recovery partition is used for resetting or restoring Windows, can be deleted if you use image backups & don't want to ever use the reset or recovery options, and you may wind up with an extra recovery partition after upgrading win10 versions. The boot partition, the one that's FAT32, is currently 100MB after a new win10 install, but in the past could be 300MB or so. It's necessary for devices with the BIOS set to UEFI mode, since that mode cannot, will not find Windows boot files anywhere besides on a FAT32 partition. The reserved partition size could also vary historically, depending on which version of win10 was originally installed. It can store GPT-related info, and stored the Windows files necessary for BitLocker etc. You can get rid of it, but at 128MB, it's not worth bothering with. consuella, YES ! It's system files. consuella, 1 of those Partitions will be labelled "System & Boot". If you delete that, goodbye computer login. consuella, 1 of those Partitions will be labelled "System & Boot". If you delete that, goodbye computer login. Thank you for your kind advice. Very much appreciated. Thank you very much for your advice. I am going to heed your warning and will not touch that partition. consuella, if you want to play with a fully allocated windows system drives partition arrangment when it is just the bare essentials like that and none of those small other function partitions are of significant size to be worth the risk of trashing the system... consider getting a new significantly bigger faster drive and migrating everything over to it then either add a new GPT partition for ancillary data like moving your documents and Video and Music and Downloads folders to and create a new Program Files Heirachy there too and put new program in the new partitions program files heirachy to avoid fragmenting the system drives file allocations. I believe the reserved 128M partition is reserved for bitlocker encrypting/decrypting pre-boot for the C:\ drives partition which the small reserved partition MAY be removable and desirable to do in MBR based partition schemes because of its limit of 4 primary partitions but on GPT partition schemes there is no such restriction so you can create new primary partitions as unallocated space allows! Thank you so much for your time and very helpful advice. It is from such super knowledgeable people like you that many of us get some great advice here and learn new things in our quest to become better educated in using various computing tools. It is from such very knowledgeable people like you that many of us get some great advice here and learn new things and become better educated in using our computers. Can this software safely move apps from the overloaded C: drive to E: or USB drive? Would this improve performance on C:? Question: I have drives C: and E: and large USB drive. On C: I have way too many seldom used apps on C: Can this software safely move apps from the overloaded C: drive to E: or USB drive? Would this improve performance on C:? HawaiiTex, this is NOT a file moving tool but a partition based migration tool and partition manipulation tool. Assuming you are mixing up the terms apps as the desktop programs and NOT the windows store apps then the best way to do it is to uninstall the programs from the C drive and re-install them to a similar E:\Program Files folder heirachy that you'll need to set up with the correct access permissions to maintain the Microsoft configured security layers on the new E: drive. And accept the fact that some programs do not offer the option to set the install location and leave those on the C: drive. There is a far more technical way to move all the C:\Program Files\ contents to another physical drive but that is beyond the scope of this comments section. If you do mean the windows store apps then sorry without making undocumented changes to window it is not possible to safely migrate those apps to a different drive. HawaiiTex, this is NOT a file moving tool but a partition based migration tool and partition manipulation tool. Assuming you are mixing up the terms apps as the desktop programs and NOT the windows store apps then the best way to do it is to uninstall the programs from the C drive and re-install them to a similar E:\Program Files folder heirachy that you'll need to set up with the correct access permissions to maintain the Microsoft configured security layers on the new E: drive. And accept the fact that some programs do not offer the option to set the install location and leave those on the C: drive. There is a far more technical way to move all the C:\Program Files\ contents to another physical drive but that is beyond the scope of this comments section. If you do mean the windows store apps then sorry without making undocumented changes to window it is not possible to safely migrate those apps to a different drive. "Can this software safely move apps from the overloaded C"
No. There are a few apps that say that they can do this but IMHO it's going to be hit or miss, at best. 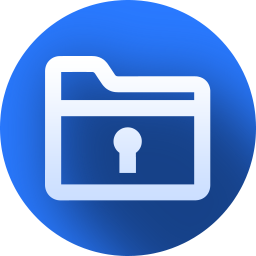 Software often adds files/folders to ProgramData &/or the User files, & references those locations in the registry, & sometimes in the app's code itself. What you have to do is uninstall the software, then try to reinstall it on the drive partition you want -- some, relative few apps will not let you choose the destination folder, which is why I say "try to reinstall where you want." "Would this improve performance on C:?" Only if C:\ does not have enough free space for Windows to operate properly. FWIW in win10 you can open Task Mgr., & the detailed view will show you the amount of disk activity -- in win7-8 you can find 3rd party apps that do much the same. If you find that when your device seems slow, the disk activity is maxed out, then a faster drive, either conventional or ideally SSD will help. If the disk activity is fairly low, say 10-20%, it might still help but not that much. HawaiiTex, <i>"Can this software safely move apps from the overloaded C"</i> No. There are a few apps that say that they can do this but IMHO it's going to be hit or miss, at best. Software often adds files/folders to ProgramData &/or the User files, & references those locations in the registry, & sometimes in the app's code itself. What you have to do is uninstall the software, then try to reinstall it on the drive partition you want -- some, relative few apps will not let you choose the destination folder, which is why I say "try to reinstall where you want." <i>"Would this improve performance on C:? "</i> Only if C:\ does not have enough free space for Windows to operate properly. FWIW in win10 you can open Task Mgr., & the detailed view will show you the amount of disk activity -- in win7-8 you can find 3rd party apps that do much the same. If you find that when your device seems slow, the disk activity is maxed out, then a faster drive, either conventional or ideally SSD will help. If the disk activity is fairly low, say 10-20%, it might still help but not that much. Just a quick note: you can now move the location of win10's store apps in Settings, though individual 3rd party apps may not always like it. You can also move several of the user folders, e.g. MyDocs. TK, Just a quick note: you can now move the location of win10's store apps in Settings, though individual 3rd party apps may not always like it. You can also move several of the user folders, e.g. MyDocs. mike, but can you move those apps that come pre-installed... I tried many methods and all resulted in non functioning default apps or disappearing default apps that required either system restore or profile recreation to get functioninality back. Yes moving user special data folders mostly works the problems come from when developers refuse to abide by the development rules and hard code the paths to users documents and music and downloads and video folders using C:\Users\%USERNAME%\AppData\Documents instead of the user change-able value also the techniques described online to change the download or install location of windows store derived universal apps does not work for me as it demands to uninstall existing pre-installed apps before it can contnue which no one wants to do... and the Move button on the Apps entries in Apps and Features is disabled so cannot be used to pre-move the pre-installed apps and ones I have already installed myself... in other words the documented procedures from 3rd party websites do not work in all circumstances. It may be possible to hack the default app save to location for the default account template so that when a new account is created the initial save apps to/install apps to is the bigger secondary drive and not the smaller write sensative primary SSD drive and maybe Microsoft Edge and other default apps will use the non-SSD drive for all its writes, but I doubt they will behave nicely... I will have to leave that experiment for another time... I don't fancy having to recreate all my other optimizations on yet another user account! mike, but can you move those apps that come pre-installed... I tried many methods and all resulted in non functioning default apps or disappearing default apps that required either system restore or profile recreation to get functioninality back. Yes moving user special data folders mostly works the problems come from when developers refuse to abide by the development rules and hard code the paths to users documents and music and downloads and video folders using C:\Users\%USERNAME%\AppData\Documents instead of the user change-able value also the techniques described online to change the download or install location of windows store derived universal apps does not work for me as it demands to uninstall existing pre-installed apps before it can contnue which no one wants to do... and the Move button on the Apps entries in Apps and Features is disabled so cannot be used to pre-move the pre-installed apps and ones I have already installed myself... in other words the documented procedures from 3rd party websites do not work in all circumstances. I have moved many of the *designed* to be moveable folders and some other folders that are frequently written to for no good reason by other means but some files and folders currently cannot be moved.... It may be possible to hack the default app save to location for the default account template so that when a new account is created the initial save apps to/install apps to is the bigger secondary drive and not the smaller write sensative primary SSD drive and maybe Microsoft Edge and other default apps will use the non-SSD drive for all its writes, but I doubt they will behave nicely... I will have to leave that experiment for another time... I don't fancy having to recreate all my other optimizations on yet another user account! I've been using P Magic for what seems like forever, and this is identical to that OS formatter. Good giveaway, but I'll continue to use Pmagic it is the absolute best live utility OS I've ever used, and this is only a very small part of it! Panzhihua Bada Technology Co., Ltd. I get: Windows Defender SmartScreen prevented an unrecognized app from starting. Running this app might put your PC at risk. App: Setup.exe Publisher: Panzhihua Bada Technology Co., Ltd.
[ Tom ], yes, just like using kitchen knives can put your health at risk if you don't know how to handle kitchen knives. These things are not dangerous or malicious in and of themselves, but mishandled, the each have no way of disciplining their handler, no way of way of saying "no, don't do that" to whatever the user directs them to do.
. [ Tom ], yes, just like using kitchen knives can put your health at risk if you don't know how to handle kitchen knives. These things are not dangerous or malicious in and of themselves, but mishandled, the each have no way of disciplining their handler, no way of way of saying "no, don't do that" to whatever the user directs them to do. .
Can this product create an NTFS partition on an external drive that is formatted FAT32? If not, does anyone know of a free product that can do this? No reason why not, unless the external drive you're talking about is a USB stick -- then it gets tricky because Windows won't normally recognize more than one partition. You'll have to shrink the existing FAT32 partition, or delete it & create a new one, leaving the amount of unallocated space you want to use for the NTFS partition. Then just create the new partition in that unallocated space, and format it NTFS. Marc Goldberg, No reason why not, unless the external drive you're talking about is a USB stick -- then it gets tricky because Windows won't normally recognize more than one partition. You'll have to shrink the existing FAT32 partition, or delete it & create a new one, leaving the amount of unallocated space you want to use for the NTFS partition. Then just create the new partition in that unallocated space, and format it NTFS. It *might* not work on FLASH memory cards though. Also if you choose to create multiple NTFS partitions on a SD card windows will NOT see the second or more partitions unless the driver for the card reader is hacked to make it apear as a hard drive rather than a removable memory card. It can be done, I have split a 16G SDcard into two NTFS partitions and used them to expand a 4Gig EeePC to let it run XP SP3 without crippling itself. Marc Goldberg, you should be able to convert the old FAT32 partition to NTFS using the convert commandline program... see https://support.office.com/en-us/article/convert-a-fat-or-fat32-drive-to-ntfs-fa1d020b-afbc-466f-8454-6b31fbe89f7a It *might* not work on FLASH memory cards though. Also if you choose to create multiple NTFS partitions on a SD card windows will NOT see the second or more partitions unless the driver for the card reader is hacked to make it apear as a hard drive rather than a removable memory card. It can be done, I have split a 16G SDcard into two NTFS partitions and used them to expand a 4Gig EeePC to let it run XP SP3 without crippling itself. D Murphy, thanks. I have an external 2TB FAT32 drive that's almost half full and I want to put some large files and a drive image on it (FAT won't take very large files). I thought if I could shrink the FAT and partition half of it as NTFS, I could get everything on that and then change the FAT to NTFS. Convoluted solution to not having another large external drive. mike, thanks. this is the feedback that seems to solve the problem. I'll download product and try. I am curious, why is a stick or flashdrive different from a physically larger external usb drive. Marc Goldberg, the source of the difference is how the drivers are configured and historicaly designed WIndows by default refuses to even acknowledge second partitions on SD cards and the like and USB flash drives apparently. Linux does not have that unwanted feature and is a widely known way to re-partiton external micro-sd cards in android so one smaller FAT32 partion exists as partition 0 and an extra ext4 file system is added and mounted to enable apps to be moved to the ext4 file system and symlinked to from the internal location where that old version of android had to think they were. D Murphy, The only reason I am aware of for wanting to retain a FAT32 partition on a USB hard drive is if it is ever going to be plugged into some embeded system like an older digital TV or set top box or even a Windows 98/ME system that does not support NTFS and only supports FAT32 fromatted storage. Last time I used the Windows convert .exe commandline tool to convert an existing drive from FAT32 to NTFS for the very same reason wanting to store a moderately large 70Gbyte VHD file for an old laptops system on the 1TByte external drive. The filesystems ended up significantly fragmented by the conversion. Downloaded, installed and registered OK? When run from either installed or portable version an error pops up consistently so I uninstalled it after taking a look to see what benefits it has over the other free partition manager I got from you and I really couldn't see any. Windows tried to stop me from installing or running it altogether. Downloaded, installed and registered OK? When run from either installed or portable version an error pops up consistently so I uninstalled it after taking a look to see what benefits it has over the other free partition manager I got from you and I really couldn't see any. Windows tried to stop me from installing or running it altogether. Looks like the paid version (this one) supports server as well as home computers, so this should work on PC. See Livewire review. is there any info on how to join drives? Not sure what you mean by join drives... If you mean merge partitions, which take the contents of one partition and puts it in a folder on a 2nd partition, then yes. If you mean something like Windows Storage Spaces or RAID JBOD, where you see one pool of storage space, you wouldn't use partitioning software for that. Karen Stavert, Not sure what you mean by join drives... If you mean merge partitions, which take the contents of one partition and puts it in a folder on a 2nd partition, then yes. If you mean something like Windows Storage Spaces or RAID JBOD, where you see one pool of storage space, you wouldn't use partitioning software for that. Windows allows attaching a second drive as a subdirectory of an existing drive, effectively making both spaces available under the first drive's volume. The challenge is when folks already have data they want to keep on each drive, but don't have a backup when they play with partition tools -- "oops, how did it go blank?". Try a test with two old cheap small drives until you find what you think will work for you, and hope it survives if either fails or become separated. However, larger drives are cheaper than retyping and rephotographing and rerecording lost data. , [ Karen Stavert ], Windows allows attaching a second drive as a subdirectory of an existing drive, effectively making both spaces available under the first drive's volume. The challenge is when folks already have data they want to keep on each drive, but don't have a backup when they play with partition tools -- "oops, how did it go blank?". Try a test with two old cheap small drives until you find what you think will work for you, and hope it survives if either fails or become separated. However, larger drives are cheaper than retyping and rephotographing and rerecording lost data. .
i do not understand 'server edition'??? is this not useful for personal home/office computer? i do not understand 'server edition'??? is this not useful for personal home/office computer? Karen Stavert, no this is basically the best edition they offer, most do not support server editions of windows this does as well as desktop editions of windows. This is actually one of the most compliant with the original ideals of the giveawayoftheday.com project: The vendors best edition a non-expiring license, and license code supplied within the readme.txt and additionally they are supplying 32bit and 64bit portable versions too! Will this software help me do that? Sounds like a simple job for this or any other partition manager. Karen Stavert, Sounds like a simple job for this or any other partition manager. D Murphy, Oh yes I expect a partition management program would do it quicker but I never use them myself. it would help us help you if we knew what OS you're running. I'm assuming it's Win 10. Also, you have free space in at least one of the other 2 partitons, so you can shrink the one adjacent to the system partition, right? Otherwise you need a larger hdd. The basic functionality is built into the OS and doesn't require additional software. Right click on the Windows icon (the one you normally left click to open the menu containing all your programs). In the menu that pops up, left click "Disk management". In the window that pops up, in the lower half, to the right of "Disk 0", find the partiton immediately to the right of your C drive. Right click that partiton and left click "Shrink volume". Choose by how much you want to shrink it (no more than the free space available), click any OK and/or Apply buttons. Then right click the C partiton and left click "Extend volume". Confirm/apply any changes. If you need more space, you may 1) move data from the 2nd partiton to the 3rd and do the above or 2) merge the 2nd and 3rd partitons to combine their free spaces and do the above. The latter requires a program. This one should help in theory, but too many users report too many problems with it. 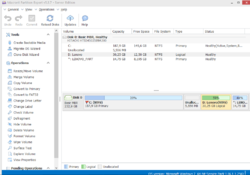 I have used Paragon Partition Manager and EaseUS Partiton Manager, both given away here in the past. The latter seems to have a free version. Search online. No program will allow you to destroy any data during the resize (you would have to delete the whole 2nd partiton, which you can do with the functionality built into the OS, and then add the free space to C). I think it is also more or less possible to find this "How to" online , but I hope my 2 cents help you. Karen, it would help us help you if we knew what OS you're running. I'm assuming it's Win 10. Also, you have free space in at least one of the other 2 partitons, so you can shrink the one adjacent to the system partition, right? Otherwise you need a larger hdd. The basic functionality is built into the OS and doesn't require additional software. Right click on the Windows icon (the one you normally left click to open the menu containing all your programs). In the menu that pops up, left click "Disk management". In the window that pops up, in the lower half, to the right of "Disk 0", find the partiton immediately to the right of your C drive. Right click that partiton and left click "Shrink volume". Choose by how much you want to shrink it (no more than the free space available), click any OK and/or Apply buttons. Then right click the C partiton and left click "Extend volume". Confirm/apply any changes. If you need more space, you may 1) move data from the 2nd partiton to the 3rd and do the above or 2) merge the 2nd and 3rd partitons to combine their free spaces and do the above. The latter requires a program. This one should help in theory, but too many users report too many problems with it. I have used Paragon Partition Manager and EaseUS Partiton Manager, both given away here in the past. The latter seems to have a free version. Search online. No program will allow you to destroy any data during the resize (you would have to delete the whole 2nd partiton, which you can do with the functionality built into the OS, and then add the free space to C). I think it is also more or less possible to find this "How to" online , but I hope my 2 cents help you. If I understand correctly you've got the system partition with Windows on it as drive C:, & 2 other partitions D: & E:. You want to make C: larger. Since the data on D: & E: don't matter, simply delete one or both partitions, then enlarge C: to take up the now empty, unallocated space. Or you can enlarge C: to take up most, but not all of that space, creating a new partition, or 2, using the remaining space. Karen Stavert, If I understand correctly you've got the system partition with Windows on it as drive C:, & 2 other partitions D: & E:. You want to make C: larger. Since the data on D: & E: don't matter, simply delete one or both partitions, then enlarge C: to take up the now empty, unallocated space. Or you can enlarge C: to take up most, but not all of that space, creating a new partition, or 2, using the remaining space. Your question was 'Will this software help me to do that?'. SO I answered. I have not used this particular program and as with any program, it will provide instructions on its use. It is likely a simple matter of grabbing a bar and pulling it over into an adjacent partition. Regardless, I am sure it can do what you want and you need merely look at it and follow the basic user instructions. It WILL be simple! Karen, Your question was 'Will this software help me to do that?'. SO I answered. I have not used this particular program and as with any program, it will provide instructions on its use. It is likely a simple matter of grabbing a bar and pulling it over into an adjacent partition. Regardless, I am sure it can do what you want and you need merely look at it and follow the basic user instructions. It WILL be simple! Karen Stavert, Having seen other replies I would like to point out that most shop bought PCs have 3 partitions on the internal hard drive. These being your C: drive partition; your boot up partition and a recovery partition. I would not expect the boot partition or the recovery partition to be visible in the file manager or have any substantial amount of free space and IMO it would be a bad idea to change them. Can it revert GPT to MBR disk? I have a 1 TB disk currently on GPT but it is not easy to do a recovery with Acronis or other programs with all the fiddling around required in the BIOS. The short answer is yes. The long answer is there might be issues that make this complicated... Your device's BIOS may be limited to UEFI, or have the capability to use UEFI or Legacy [CSM] boot methods. UEFI needs Windows EFI boot files to be on a FAT32 partition that's hidden & restricted by default, while the disk itself can be MBR or GPT. Legacy requires Windows legacy boot files that can be pretty much anywhere, but if your device BIOS detects a GPT disk, it may switch to UEFI mode automatically. So, if you convert the drive from GPT to MBR, you're not really changing the way your device boots. To do that you have to add the legacy boot files [EasyBCD or BCDBoot], then switch the BIOS over to Legacy [CSM] mode. Since you say your main issue is with recovery, I assume your problems are getting a USB stick/drive to boot. The easy, & more correct solution might be to simply create UEFI compatible bootable USB sticks/drives. If the software you're using cannot create a UEFI bootable USB stick that works, see if it will create a ISO, or create a DVD & make an ISO from that, then use the free rufus to put it on a bootable USB stick/drive. Rubycat, The short answer is yes. The long answer is there might be issues that make this complicated... Your device's BIOS may be limited to UEFI, or have the capability to use UEFI or Legacy [CSM] boot methods. UEFI needs Windows EFI boot files to be on a FAT32 partition that's hidden & restricted by default, while the disk itself can be MBR or GPT. Legacy requires Windows legacy boot files that can be pretty much anywhere, but if your device BIOS detects a GPT disk, it may switch to UEFI mode automatically. So, if you convert the drive from GPT to MBR, you're not really changing the way your device boots. To do that you have to add the legacy boot files [EasyBCD or BCDBoot], then switch the BIOS over to Legacy [CSM] mode. Since you say your main issue is with recovery, I assume your problems are getting a USB stick/drive to boot. The easy, & more correct solution might be to simply create UEFI compatible bootable USB sticks/drives. If the software you're using cannot create a UEFI bootable USB stick that works, see if it will create a ISO, or create a DVD & make an ISO from that, then use the free rufus to put it on a bootable USB stick/drive. Rubycat, assuming you can make your computer boot to MBR instead of GPT and there are less than 4 primary partitions on the GPT drive and you are not concerned about possibly losing factory restore partition operation assuming it is an OEM primary drive... Personally I think it'd be easiler to switch to a GPT aware recovery program than rely on an old free probably WD OEM edition of Acronis True Image or something similar. How to use the portable version? otherwise the registered version would be turned into a trial. "? How to use the portable version? Multiple downloads have the same serial. So what's the point of "NB: After you have successfully registered the software, please do not register it again or reinstall it, otherwise the registered version would be turned into a trial. "? IMHO that's just boilerplate text. The portable version really isn't, strictly speaking, BTW. The app adds it's drivers, whether you're running the portable version or installing it from the setup file. Most partitioning apps add drivers -- the only exception I'm aware of is Partition Guru, a past GOTD. MH, IMHO that's just boilerplate text. The portable version really isn't, strictly speaking, BTW. The app adds it's drivers, whether you're running the portable version or installing it from the setup file. Most partitioning apps add drivers -- the only exception I'm aware of is Partition Guru, a past GOTD. This is exactly the same thing like the Professional Edition, except that it supports Windows Server OS on top of the Professional features. So yes, you can use it just fine on a regular Desktop instead of a Windows Server, if you don't have one. I agree with First Comment: its not "real clear" if this software is for Servers Only. Could macrorit or GAOTD confirm? Meanwhile: it "looks like" any other partition program with some excellent safety features. It downloaded and registered just as it should and opened very fast. I have a gut feel this is an excellent program for home users too. But I won't use it until confirmation. I searched Macrorit and found instructions that 99.9999 says the program is for the home pc. Just not that last little .0001. 1. Lietime license with no free upgrades. ??? Al, Yes, what is your question? Al, In fact... just recently downloaded the latest portable edition and it found the stored server license from this giveaway and enabled the server license in version 5.3.9... so then installed the full server trial and it too used the 5.3.7 giveaway server license too. So this was a better than best practice giveaway! What's the difference of a Server partition to a regular partition? What does that mean for a "normal" home user? What's different about this Server edition? Windows Server partitioning software works on Windows Servers. Typical partitioning software does not. Server software usually costs several times more than the consumer (non-server) version of the same software. M. H., Windows Server partitioning software works on Windows Servers. Typical partitioning software does not. Server software usually costs several times more than the consumer (non-server) version of the same software. Will it work on normal PCs? Hi Oreguy, Got it. But what about the other way around? Will it work on normal PCs? I uninstalled Macrorit Partition Expert Pro and then installed Macrorit Partition Expert Server 5.3.7. Windows 10 home 64 bits. Katalin, I uninstalled Macrorit Partition Expert Pro and then installed Macrorit Partition Expert Server 5.3.7. It looks ok. Windows 10 home 64 bits. Thanks to all for feedback!